Wilhelm Lanzky-Otto was the father of the modern Swedish school of horn playing and arguably the single greatest influence on Scandinavian horn playing as a whole. He inspired a so-called "Lanzky School" of horn playing, influencing others as both player and teacher. Indeed, many of the prominent horn players throughout Scandinavia today are either pupils of, or have been influenced by, the "Lanzky School" style. 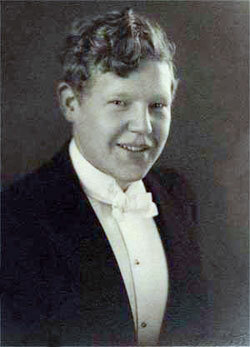 Wilhelm was born in Copenhagen in 1909 and began intensive musical studies in piano at age five, first with his mother then at a piano school. Later his studies included the violin, viola, music theory, conducting, and organ. He concertized and taught piano on many occasions throughout his life. In 1928 he was offered a free place at the Royal Danish Conservatory; the same year he received an academic degree. Along with many other activities, Wilhelm learned to play horn with such success that after only a year he was engaged as assistant principal in Denmark's leading opera orchestra, the Royal Orchestra. He still continued his studies at the conservatory, receiving a piano diploma in 1930 and an organ diploma in 1931.Wilhelm took up the horn so that, if he did not succeed as a professional pianist, he would have an orchestral instrument to fall back on. He could have continued with violin, but with more violinists than demand at this time, the horn provided better opportunity. He studied with Hans Sörensen until 1929. After graduating from the conservatory, he became principal horn in the Tivoli Concert Hall Orchestra. Both the Tivoli and Royal orchestra seasons were four months in the summer, which allowed him to study the rest of the year. During these years, Wilhelm helped found Blaserkvintetten af 1932 (1932 Wind Quintet), which inspired Danish composers to increase the repertoire for wind quintet. From 1936-45, he was principal horn with the Danish State Radio Symphony Orchestra, frequently appearing as piano and/or horn soloist. In 1944, his teacher, Hans Sörensen, died. Wilhelm took over his position as principal horn in the Royal Orchestra and horn professor at the Royal Danish Conservatory. Then he took a post as piano teacher at the conservatory in Reykjavik, Iceland, combined with principal horn with the Iceland Symphony Orchestra. He also conducted bands and toured as pianist, horn player, or accompanist and worked with many of the great musicians of the day as they stopped in Iceland on their way to and from America. Wilhelm later often referred to "the happy years in Iceland." Wilhelm was asked to fill a position with the Gothenburg Symphony Orchestra in Sweden. Travel was expensive, so a "lacquer" recording and a photograph were sent in place of an audition. He also became teacher of horn and piano at the orchestral school of Gothenburg. After solo tours and broadcasts (in part to make himself known in Stockholm), he was offered the principal horn position in the Royal Stockholm Philharmonic Orchestra in 1956, then applied for and was given the post of horn teacher at the Royal Academy of Music in Stockholm. Later he helped found the Stockholm Wind Quintet and a brass group, Musica Nova. Horn playing is at a high standard in Sweden, in large measure due to Wilhelm's influence. His style is a continuation of the classical Danish horn tradition, which itself is a continuation of the tradition found in France, Austria, and Germany. Notable students include his son Ib (who also has been principal horn in the Stockholm Philharmonic and is an IHS Honorary Member), Frøydis Ree Wekre, Rolf Bengtsson, and Sören Hermansson. Because of his broad musical and general education, Wilhelm was known for his interpretative skills. He had a gift for working from particular students' limitations and needs, preaching a particular style of playing while leaving students free to interpret works in their own way. Wilhelm also promoted equality between the principal and associate principal horn in the orchestra to the point that one never knows quite who is playing which horn part in the Stockholm Philharmonic. In this way, the associate does not build up a fear of the big solos, and the principal has the freedom to pursue solo and other activities without the orchestra suffering. On the other hand, he believed that the section should follow the style of the principal horn without question. Philip Farkas, in his book A Photographic Study of 40 Virtuoso Horn Players' Embouchures, describes Wilhelm as having "an extremely large, round, and ringing tone, superior high register, superior middle register, superior low register, superior legato and slurs, moderately fast tongue speed, excellent loud dynamics, and superior soft dynamics." In 1967, Wilhelm "retired" to fourth horn in the Philharmonic, and retired from the orchestra in 1974. He was made an IHS Honorary Member in 1978 and died in 1991. A longer article about Wilhelm by his son Ib appears in the May 2005 issue of The Horn Call.